Animal Crossing: New Leaf – Gotta get them bells! 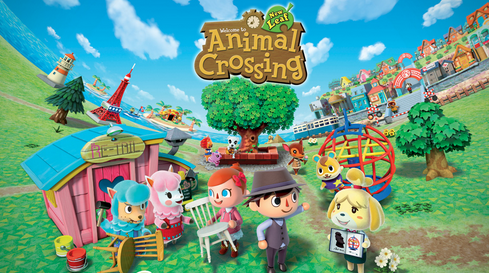 I felt like writing a review for Animal Crossing: New Leaf for the 3DS would be difficult. The main problem is this game is experienced throughout an entire year with different events and seasons changing the way the game is played and enjoyed. After a couple months with the game, lots of repaid loans, tons of public work projects, a few hundred bee stings, and a knack for having my villagers say awkward things I feel confident I know what this game is all about. It is easy to look at this game and just point out that its just another Sims/Farmville/Animal Crossing game, but I don’t think thats the point. In something like the Sims your main priority is keeping your Sim from losing their job, losing their relationships, or peeing their pants. In Animal Crossing their is no real forced timeline. You are never stressed about having to get something done in a certain time (unless you are playing one of the mini-games on the island) and you certainly have no bodily function issues to focus on. There are no crops to plant or harvest, although you could do that if you wanted (I got rid of most of my fruit trees after realizing you could plant non-fruit bearing trees). The way I am explaining it sounds like their is no real point, but bear with me as I will try my best to explain its hooks. 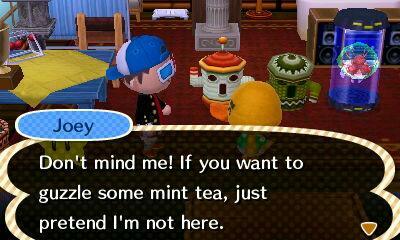 One of the easiest way to describe life in Animal Crossing is to relate it to World of Warcraft. I know that sounds crazy but if you look at secondary professions in WoW like fishing, cooking, etc. that is exactly what Animal Crossing feels like. Although you don’t gain skill points in your fishing, bug catchings, balloon popping, flower watering, you do get better at them as time goes on. You develop your own pattern and efficient method at which to maintain your town. Another WoW-like similarity is the “dailies”. In WoW you have a set of quests that can only be done once a day and they generally don’t give you a great reward right away, but instead pay off over a long period of time. In ACNL the same is true with activities like fossil digging, shaking trees, planting/watering flowers, purchasing items at your shops, etc. Everything you do does not generally give you immediate satisfaction but instead builds to something larger and larger. It is that kind of slow progression with that dangling carrot that keeps me coming back day after day. Something that is really neat about this game is the way you can interact with the larger Animal Crossing community. One of the main features is the Dream Suite, a shop that lets you create a “dream” version of your town that allows other ACNL owners to experience your town without the ability to cut down your trees or tear up your flowers (well they can, but it is not permanent). Another feature I have spent a lot of time with (check my twitter feed and you can tell) is the ability to take in game screenshots and then share them on Twitter/Facebook auto-generating a #ACNL hashtag. This is a a great easy way to share what you are doing in your town as well as seeing what others are posting. For StreetPass you share your house, with people who own the game able to go inside your house and view how it is laid out with the ability to purchase products in your home. Lastly, the big N has released “Animal Crossing: New Leaf Plaza” for the WiiU. This is an application/MiiVerse community that lets you interact with all your favorite towns folk and post your thoughts, comments, pictures right to the MiiVerse. Within hours of the launch of this the MiiVerse was full of posts, pictures, and more. Is Animal Crossing a game for everyone? Absolutely not. Is it a game everyone should at least spend a little time with to see if it scratches an itch that you didn’t know you had? Absolutely. 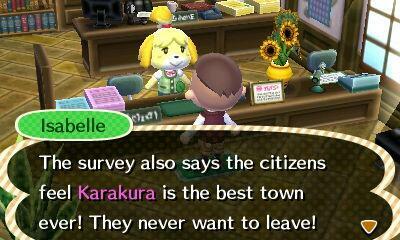 Having your own town with which to shape & mold while also interacting with some unique/hilarious/terrifying animals is something that I think most people could find some sort of enjoyment with. ACNL is a great way to unwind and the amount of content will keep any type of gamer coming back for more for years to come.